An incredibly sophisticated attraction, The Amazing Adventures of Spider-Man blurs the line between virtual and reality so well that you'll emerge slack-jawed and awe-struck. Already one of the best theme park rides in the world since its introduction in 1999, a 2012 makeover added all-new HD film animation, new 3-D glasses, and other enhancements that produce remarkably crisp and bright images and make the attraction even more immersive and awe-inspiring. Could you handle it? The physical ride, save for some fairly benign spinning, is not extreme. My coaster-averse mother-in-law was just fine on it; chances are, you'll be OK as well. Younger children may find some of the scenes frightening. 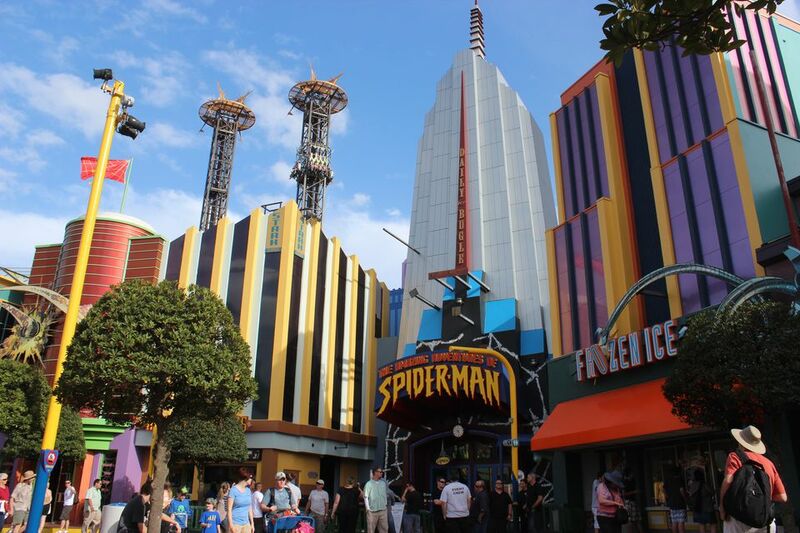 Spider-Man is one of the 12 Best Rides at Universal Orlando. Spider-Man is the everything-but-the-kitchen-sink of high-tech theme park attractions. It is a "dark ride," an industry term for an attraction that sends guests through an indoor environment. In this case, riders climb aboard 12-passenger "Scoop" vehicles to journey through the ravaged streets of New York City and face a sextet of Spidey's most ruthless villains. In addition to traveling from scene to scene, the computer-controlled vehicles are outfitted with motion bases. They move in synch with filmed action that is rear-projected on dozens of screens throughout the ride. Here's where it gets completely insane: The filmed sequences are presented in high-definition 3-D.
Spider-Man appears out of nowhere and lands with an audible and tactile ka-thunk on the moving vehicle. One of his archenemies, the Hobgoblin, hurls a flaming pumpkin, and real flames all but singe the hairs off riders' skin. (The multi-sensory effects make this a "4-D" attraction.) The final sequence, a 400-foot "sensory drop" off the top of a skyscraper, is so utterly convincing, it will completely take your breath away. In reality, however, the motion-base vehicles never leave the ground and never move more than a few miles per hour. It's all an illusion. So how DO they do that? "The real magic of Spider-Man is creating an environment in which the boundaries of film projection have been shattered," says Mark Woodbury of Universal Creative. The biggest challenge was manipulating the 3-D images so that they wouldn't appear distorted to the passengers in a moving vehicle. "This technology, a 'moving point of convergence,' didn't exist," notes Woodbury. "We had to create it." "Everybody told us it couldn't be done," adds Scott Trowbridge, Spider-Man's original show producer. A self-described "creative person with a bit of a techno-geek streak," he and his team persevered. They included many subtleties in the attraction to reinforce the illusion. For example, when a filmed 3-D object enters a scene, a shadow of the object appears on the real wall. "It helps fulfill your brain's expectations and uses them against you," Trowbridge explains. "You can make the leap of faith." The 2012 update enhanced nearly every aspect of the ride experience. The most significant changes were the re-rendering of all of the footage in 4K digital high-definition animation, next-generation 3-D glasses (no more of the "ghosting" that was caused by images leaking from one eye to the other in the old polarized lenses), and a new digital projection system. Veterans of the original attraction may be a bit startled when they see the level of detail and depth made possible by the improvements. It's somewhat like the whoa! moment you may have had when you traded in your clunky console TV and viewed your spiffy new HD model for the first time -- except your couch didn't whisk you from room to room. Because they re-animated all of the scenes, Universal's ride designers were free to add new elements. The story remains unchanged, and the ride experience is essentially the same, but there are hidden gems to discover throughout the ride. For example, Marvel legend and Spider-Man co-creator Stan Lee has been inserted into multiple scenes. Eagle-eyed riders may notice rats scampering in and out of view. The little things really seem to make a difference. The sight of the main characters, with their comic book costumes shimmering and their HD muscles rippling, is striking. I am especially impressed with the new look of background details, however. The skyscraper freefall scene, for instance, is all the more astonishing when you notice minutiae like the headlight beams that now emanate so realistically from the cars on the street below. "The technology didn't exist in 1999 to do what we always wanted to do with Spider-Man," says Thierry Coup, senior vice president of Universal Creative and one of the attraction's original designers. After working on newer groundbreaking rides such as Harry Potter and the Forbidden Journey, he felt the time was right to revisit the Marvel attraction. "We wanted to take you into a whole new world, and now we can." Using the same ride system and basic ride concept as Spider-Man, Universal introduced Transformers: The Ride 3D at its parks in Hollywood and Florida. The prototype ride has also inspired other copycat attractions such as Curse of DarKastle at Busch Gardens Williamsburg.